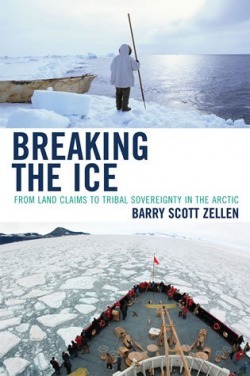 On March 30, 2008, Lexington Books published Breaking the Ice: From Land Claims to Tribal Sovereignty in the Arctic by Barry Scott Zellen. The book examines the Native rights movement in Alaska and the Canadian Arctic and the evolution of land claims policy as it crossed the international boundary, becoming a powerful tool for Native people to reclaim their heritage and re-empower themselves politically, while at the same time becoming stakeholders in the economic modernization of the North. "Barry Scott Zellen’s work is seminal—he is the first to write about comparative Inuit governance across North America. Breaking the Ice fills a critical need in the history and literature of Arctic political movements. What has occurred in Inupiat and Inuit communities in Alaska and Canada, in little more than a generation, is nothing short of remarkable. Zellen documents the evolving self-determination efforts in incredible detail and with creative insight. He rightly identifies a new and influential 'voice' that has emerged on the international scene since the Cold War. Zellen’s work will become increasingly relevant as Arctic nations struggle over rights and resources and are forced to contend with new interests and the mobilization of new actors on the world stage. The circumpolar world is fast emerging as one of the most critical regions in international studies making Breaking the Ice timely and essential." "While not a specialist on Arctic issues, as a conflict-resolution scholar specializing in Australasia, I immensely enjoyed Breaking the Ice. It is an important, fascinating and thoughtful work, as well as a welcome contribution to the study of the nexus of land, indigenous people and conflict." "For those who know a piece of today’s Arctic story, Barry Zellen neatly connects the dots from Alaska to Greenland with a wealth of detail. His research and his experience living in the region come together here to buoy a generation of scholars, scientists and policy-makers." "This history of the Alaskan and Canadian arctic breaks new ground with its contemporary narration and analysis of the past three decades of political developments and with its rich findings based on documentary and Web research. ... This large account will guide future researchers and government agents. It is not about global warming or environmental change. Summing Up: Recommended. Graduate students, faculty, professionals." 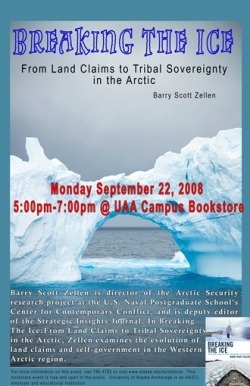 "Zellen is the research director of the Arctic Security Project at the Program for Culture and Conflict Studies (CCS) at the Naval Postgraduate School, and has been a firsthand witness to many of the struggles Native Americans experience in maintaining control and sovereignty over lands in the Far North. In this volume, the author takes a contemporary perspective of this ongoing conflict, especially in the context of global security amid the strategies of world powers. Written for an audience interested in global politics and security, Breaking the Ice also addresses the subject of the climate change, and how nature can often force the hand of humanity in compelling ways." Reviewed by Professor Barry M. Gough, Choice Reviews Online, February 2009. Recommended. Graduate students, faculty, professionals. "Breaking the Ice provides example for other cultures," by Kaitlynn Jackson, The Northern Light, October 14, 2008. This history of the Alaskan and Canadian arctic breaks new ground with its contemporary narration and analysis of the past three decades of political developments and with its rich findings based on documentary and Web research. Not a work in comparative history, this is more of a parallel treatment of government actions in regard to the norths of the two countries and the responses of the indigenous peoples. The impact of the US military in Alaska during WW II was powerful and left a legacy of federal government control. The roles of churches and missionaries is absent, but the Department of the Interior stamped its control on this northern frontier, especially when oil and gas exploration found pay dirt and means of transporting such energy resources became necessary. The Canadian story has an economic basis too, but here the emphasis was on Native politicization, often inspired by Ottawa, to develop Native self-sufficiency and to solve the persistent problems of land claims by various First Nations, including Inuit, Inuvialuit, and Gwich'in. This large account will guide future researchers and government agents. It is not about global warming or environmental change. Summing Up: Recommended. Graduate students, faculty, professionals.